“Derelict exists as an act of faith, in the possibility of theatre, and how it brings people together.” Maddy Costa reviews the pop-up Lancashire arts festival Derelict’s 2016 programme. Zuppa’s Pop-up Love Party, part of Derelict Springs. Photo: Garry Cook. Preston is a place I’ve known for 20 years without ever really knowing it at all. Listening to reflections on the city from some its inhabitants, recorded and played through earphones during a participatory piece staged along one of its main thoroughfares, I get the sense this isn’t an unusual feeling: it’s possible to live there for years and not feel part of a community. I’ve been visiting Preston more frequently since 2012 as part of a touring research project, run by Fuel, that sought to build communities around and through theatre, and over that time it’s been interesting (if disheartening) to see the persistence of that project’s difficulties. The Derelict festival exists within the challenge of resistance and rises to it beautifully. It presents work pervasively, rather than in big showy spaces, and makes it possible for people to stumble upon it and be surprised by their encounter. 6.32pm Well I’ve been here before. Ring and Fiction both started like this, with a brief plunge into darkness so that everyone present knows what they’re letting themselves in for. But they did it with more care in those earlier productions; the consideration here of anyone who hasn’t seen this kind of work before is pretty perfunctory. 6.35pm The sound feels very distant: it hasn’t got that prickling sensation of someone unseen breathing down your neck. 6.38pm In fact, I’m not really sure they’ve got anywhere else to go with this form. We all know seances are weird, they’re not doing much with it. Lovely to hear Angela Clerkin playing the main character though. 6.41pm Oooh the shipping container has started rattling. It’s like it says on the chalkboard outside, it’s turned into a fairground ride. That thing they did at the end of Fiction, where they made the sound so loud that it rattled through the floor and the chairs and your body, they’re doing it here, but with even more oomph. 6.43pm Still, I’m not sure the storyli- SOMEONE HAS STARTED TALKING LIKE A BEAST FROM THE DEPTHS OF HELL AND IT’S SO DARK IN HERE AND I KNOW IT’S AN ACTOR BUT THIS IS HORRIBLE I’M SCARED I’M SCARED AND I WANT IT TO STOP NOW PLEEEEEEEEEASE ah phew hmmm cough wow. So, um, yes. Seance was quite a thing. And it’s not even fully formed yet. I’m on more comfortable ground at Audio Caff, a welcome return from last year’s Derelict festival. Hosted by Tin Can People – in particular, baking queen Charlotte Berry – Audio Caff is a travelling homage to the joys of cake and a proper brew, a space for a rest and a natter: a traditional tea-room in all respects, except for the huge speakers positioned either side of the cake table. The room is wired for sound, with microphones positioned beneath each table, turning them into makeshift synthesiser pads. Put your cup down a bit too heavily and the thump will ricochet across the room; scrape a finger across the table cloth and the sound will echo like a scattering of gravel. In the gentlest of ways, the cafe is not what it seems, and there’s something delightful about that trickery: everyone present contributes to its percussive soundtrack, without having to be (self-)conscious of it at all. Also returning to the festival is artist Krissi Musiol, who sets up residence in Audio Caff with her piece The Dance Collector. This is such a beautiful work: inspired by her own inability as a dancer, Musiol sets out to collect dance moves from the general public – the kind of moves you do not just on the dancefloor or drunk at a party, but spinning round the kitchen to your favourite song, waiting for a bus, or even pushing a trolley round a supermarket. Through conversation she learns the moves and, at the end of her residency day, performs a brief choreography weaving them together. What makes it such a pleasure isn’t the jerky awkwardness of Musiol’s body but the quality of her attention during each conversation. She draws out people’s stories as a way of understanding dance’s place in different cultures (she herself wears a traditional Polish folk-dance costume, hand-stitched by her mum), and its changing place in British culture; and through that she’s able to elicit a move even from those who profess not to dance. Eavesdrop long enough and you get a glorious portrait of British character and society – and the sense that, as humans, we’re always dancing, just by virtue of moving in space. There’s a different kind of dance to the Larks’ Join Me: the dance of the playground, the circling and laughing of tag. The Manchester-based company spend almost the entirety of the Derelict festival at In the City, a new community centre run by University of Central Lancashire, where they invite people to play games but mostly encounter elderly types who are grateful for a sympathetic ear. The 15-minute piece for headphones that the Larks build at the end of the week, in collaboration with writer Matthew Bennett, is imbued with the delicacy of those encounters. On the pedestrianised street leading down from the Harris Museum, a small group enticed to join in by the gift of a balloon stands in circles and lines, never obstructing passers-by or demanding their attention, but halting their day none the less. Through our headphones, a voice invites us to look at each other, to play, but also to think: about what it means to forge a community, in this present moment, or in the city as a whole; what Preston has been, and what it is now; what’s here, and what’s missing. The lightness and joy of our interactions with each other are juxtaposed with the more elegiac quality of the recordings: what Preston needs is what it had a few years ago, when more was invested in city infrastructure rather than suburban multiplexes. When the performance ends and the group disperse, its traces remain: balloons bobbing down the street, clutched by small children, the people in whom Preston’s future lies. As its title suggests, Join Me is as visible and inclusive as Derelict gets; the festival’s showpiece, by contrast, seems entirely exclusive – but combats that by attracting a different audience demographic, people whose passion is food, not theatre. 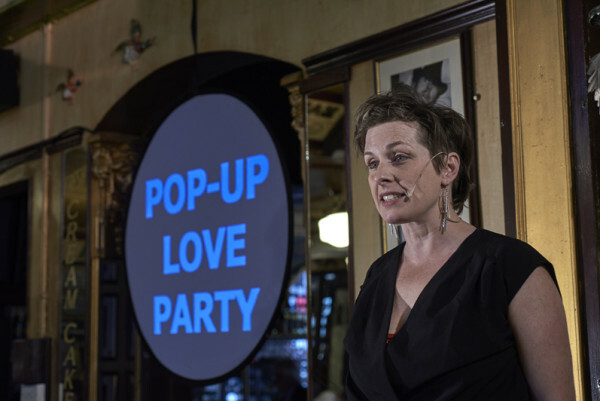 Pop-Up Love Party, a 90-minute dinner-date-meets-irreverent-debate, takes place in Brucciani’s, a charismatic local cafe whose walls are plastered with black-and-white photos of celebrities with no apparent connection to Preston, and further decorated in scrolling gold-leaf lettering advertising its menu, from bacon butties to Manchester tarts. The food that accompanies the performance, however, is far from local or homely: devised by a Michelin-starred chef with his own New York restaurant, it has a touch of the Heston Blumenthals about it, with caramelised onion dehydrated to a bark-like crisp, beetroot distilled into a shot of lukewarm tea and a deep-fried oyster, unctuous and tangy, glowing umber against a bright disc of cabbage leaf with a 7-inch record as a plate. Each dish is designed to represent a specific argument or thought on the nature of love, but with portion sizes small and the hour steadily moving past supper, what the food element communicates overwhelmingly is the insatiability of desire, a constant nagging feeling that no matter what love gives you, you’ll always be wanting more. The work of Canadian company Zuppa, this disquisition on love and eroticism follows the structure of Plato’s Symposium, with seven sections governed by a particular personality: the lawyer, the comedian, the drunken beloved. But in each section the arguments are made personal to the lives of the three performers, Stewart Legere, Susan Leblanc and Ben Stone, each of whom speaks with what feels like disarming honesty about their own relationship experiences, and what they’ve learned about love as a result. And so we see photographs of the women in Leblanc’s family, including her own small daughter; hear of Legere’s short-lived marriage and Stone’s divorce; glimpse something of Legere’s history of one-night stands. Although Legere is gay, heteronormativity shapes the general argument, and along with it the assumption that pairing up is a universal human goal. But then, the company have an answer to that in the section dedicated to the comedian, played by Stone in flannel dressing-gown and tin-foil helmet: humans were once dual beings conjoined, and ever since we were wrenched apart during an alien invasion, each individual has been searching for their other half. It’s an ambitious show for Derelict to programme, but typical of its quiet resolve: to remind the inhabitants of Preston that theatre doesn’t have to mean sitting silent in the dark, or being bored by droning exposition. It can be as informal as a get-together with friends over afternoon tea, as accessible as the conversation you’d have over dinner or a pint. With central government tightening resources and the local authority narrowing cultural provision – last year it was announced that 40 libraries and five small museums would be closed – Derelict exists as an act of faith, in the possibility of theatre, and how it brings people together. For more information on Derelict, click here.